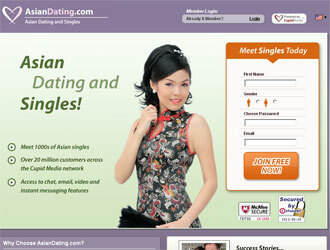 AsianDating.com specializes in connecting people of Asian background looking for romance love and marriage within or outside their race. Prospective members of any nation or race interested in Asian dating experience are welcomed to join the dating site AsianDating.com. Standard free membership allows free registration, profile creation and browsing of photo profiles of other members at no cost. The rest of the features including, on-site e-mail box, instant messenger and video chat are available for Gold and Platinum members. The site AsianDating.com has a trustworthy reputation and you may not worry about the security of your data.